You'll look like a bonafide all-star when you're wearing this adult Jackie Moon costume. And the only thing you'll need after donning the orange, white, and blue from the Will Ferrell movie "Semi Pro," is a handful of catch phrases. Don't worry, we've got you covered:"Bam! Pow! Straight to the moon...Jackie Moon. ""Yeah, sucka, you just got moon'd. ""I've got my own gravitational field...just like...the moon. "Eh, well, maybe you should just imdb a bunch of quotes from the movie and go with that. Hey, we never promised we were great trash-talkers, but we do sell amazing replica costumes, like this Jackie Moon outfit. He might need a little help with his dunking but your infant will make a splash when he signs with the Dribbles. He'll be just like a professional basketball player, tattoos and all. It's never too early to start on his future career plans! Get the greatest 'fro on earth with this licensed Jackie Moon Costume Wig, and set your Flint Tropics costume apart from the rest! It's styled in a curly mop, and comes with an orange & white striped headband (not all-white as in this photo). Everybody panic! There are tons of games that require a ref, like football, basketball and the ever dangerous, game of love. Think of the kind of power you'd have if you wore a referee shirt! You could call fouls, enforce penalties and even suspend players. Or you could just use it to practice cheesy sports themed pick up lines on girls. We're not really going to judge either way - that'll be your job as a ref anyways. "Let's get Tropical! "In Flint, Michigan there is what can be considered the greatest basketball teams ever, depending on who ask. The person who stated this as a fact would be none other than the Tropics owner, head coach, and star player Jackie Moon. He has always been a fan of his own team and always makes sure that he puts on a show for his fans. Now this has some times included interesting stunts like wrestling a bear. Give yourself a chance to train with the Tropics in this warm up costume! Be the best baller on the court! This Funny Basketball Player Costume will give you a gigantic fro and the gigantic feet to lead your team to victory. This cartoonish costume will be a hit at any party; needless to say it's one slam dunk of a costume. Over the line? Out. Ball crossed base before player reaches it? Out. Cheesy pickup line? Foul. 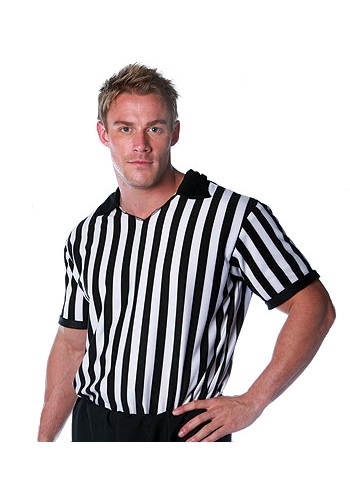 Take a little time out of playing the game, and start calling the shots of the game with this Womens Referee Costume.